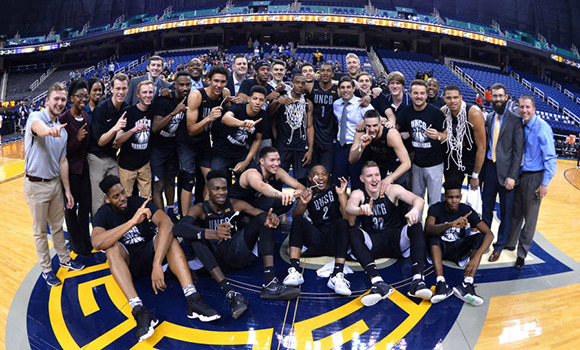 The UNCG men's basketball team poses for a picture after claiming the SoCon regular season title with a win over ETSU in February. The squad's 25-10 overall record last season was the best in the 50-year history of the program. The UNCG athletic department has announced its updated strategic plan, “The Spartan Way: 2017-2022,” a comprehensive vision that maps out the next five years for the department in concert with the university’s “Taking Giant Steps” strategic plan announced last week. The plan contains the department’s core purpose, guiding principles and strategic priorities moving forward for UNCG Athletics. The core purpose of the UNCG athletic department has been and will continue to be operating The Spartan Way to discover and develop champions in life. This plan sets a course for the department to achieve its envisioned future being a nationally-recognized athletics program continuously competing for championships. The strategic planning committee, comprised of more than 100 faculty, staff, students, alumni and friends, developed a plan with over 200 action steps to be executed over the next five years. The athletics department will operate with six guiding principles as the foundation for daily decisions: student-athlete well-being, teamwork, responsibility, integrity, development and excellence. To learn more about the new plan and the planning process, visit uncgspartans.com.